At This Material Culture we’re all about ideas, the bangle, necklace, earrings you buy weren’t churned out in a factory. Each piece has a story, a concept, and about 4 other earlier versions I decided weren’t good enough. I wanted to share the stories behind some of our pieces with you because we’re not a faceless company, we are two quirky, creative people with a passion for creating products that mean something (and are really pretty). So here’s The Story Behind the This Material Culture Dinosaur Necklace. I love dinosaurs, I always have. I grew up watching Jurassic Park (it came out the year I was born – fact) and I read the book when I was about 12. There is something so fascinating and awesome about these ancient creatures, and I remember going for fossil walks when I was little with my dad and scouring up rocks to try find ammonites. I started working in the World Museum Gift Shop in Liverpool last year. If you haven’t been, you should. It’s a crazy old building with one floor of dinosaurs, then another of egyptians, then an observatory, then a floor of creepy stuffed animals – it’s awesome! 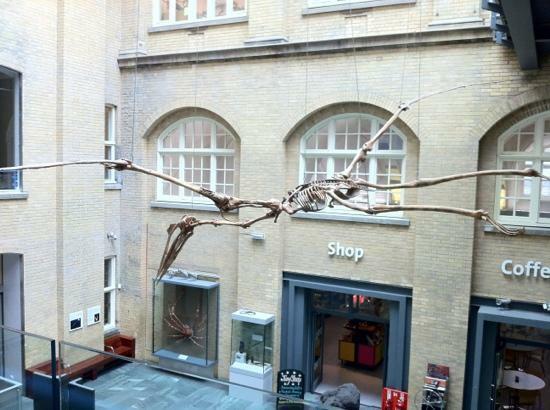 In the entrance hall there’s a giant pterosaur hanging from the ceiling, and when you finish work on a late winter evening, the museum is empty and there’s a huge flying dinosaur skeleton above you, it’s pretty special. Working in the shop, I realised I wasn’t the only ‘grown up’ who loved dinosaurs. All sorts of people ended up going home with plastic stegosaurus keyrings or a cuddly ankylosaurus or a triceratops bouncy ball, from pensioners to preening teenagers (and of course, the enthusiastic five year olds). I think the heart of our brand is being able to wear quirky awesome jewellery that features something you love. And people really love dinosaurs! So when I found these amazing T Rex charms with their big smiles and teeny arms I knew we were on to a winner. And they’ve been dead popular. We had one lady buy one because she had small arms and used to be called T Rex as a nickname. We had a little girl in a bright pink princess dress and fairy wings buy one, put it on and refuse to take it off. I’ve had people show me their dinosaur socks to prove their love and affinity with all things dinosaur. The lovely blogger Sarah wrote this fab review of our This Material Culture dinosaur necklace which you can read at moshing zombies. It’s random, adorable and so much fun and the main reason people buy one is because… guess what… they love dinosaurs! 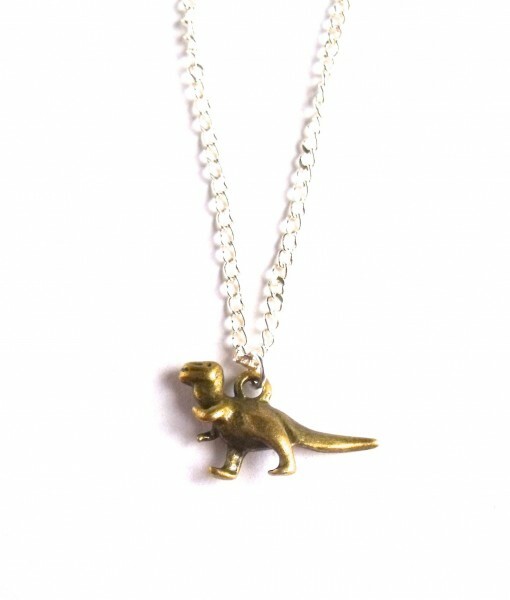 You can have your very own little T Rex pendant, and band together with us dinosaur lovers. Be proud. Wear a Dinosaur Necklace.